easy recipes | The High Life Suite | Fashion. Food. Love. 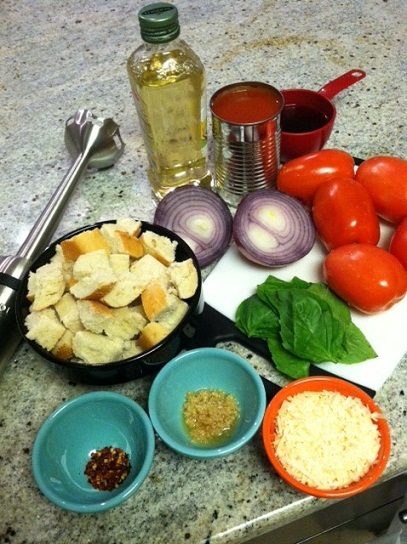 Recipe du Jour: Tomato & Day Old Bread Soup! Did I just say “day old bread”? Yup, yup I did. Have you ever gotten fresh French or Italian bread from the grocer and it comes in that huge loaf that can never seem to be finished in a day, but on the second day it’s just way too hard to simply butter and eat? Well this recipe gives you something delicious to do with that wonderful bread. 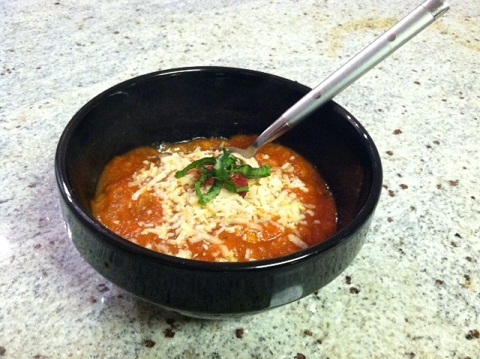 Tomato & day old bread soup is a great winter meal that is sure to stick to your bones and warm you from the inside out! Start by heating your olive oil in a deep pot. 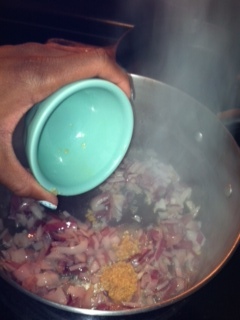 Once the oil has heated up add in the diced onion. 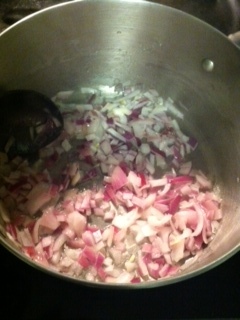 Let the onion soften and cook for 8-10 minutes, then add the crushed garlic. 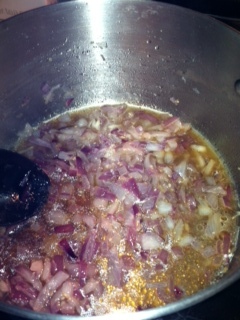 Allow the garlic to cook for a couple minutes before adding the 1/2 cup of marsala wine. 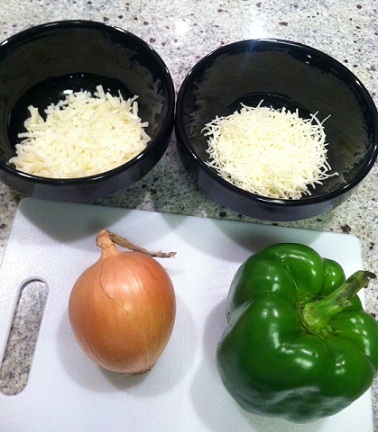 Wait until the wine reduces by half and add the red pepper flakes. Toss the diced tomatoes into the mix and let them cook for 10 minutes or until they have started to soften and break down. 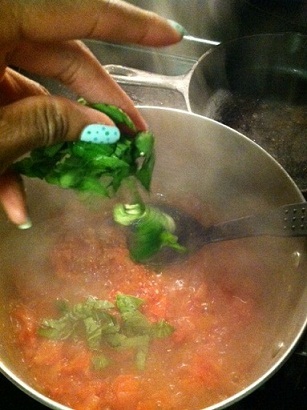 Add in the sliced basil leaves. 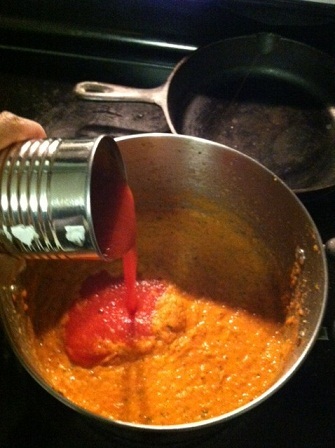 Once blended, put the pot back on the heat and add in the can of tomato sauce, as well as the cubed day old bread. Stir together and cover. 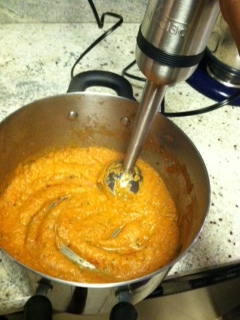 Allow the soup to simmer and thicken up for 20 minutes. 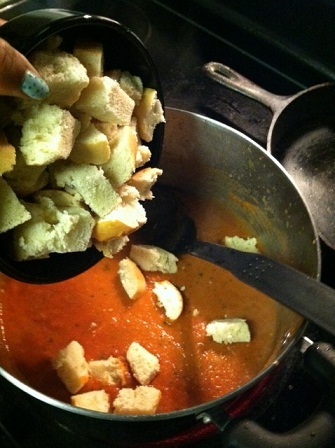 And just like that, you’ve got tomato & day old bread soup! Top with the fresh parmesan and a little freshly chopped basil. The soup is surprisingly delicious and hearty. 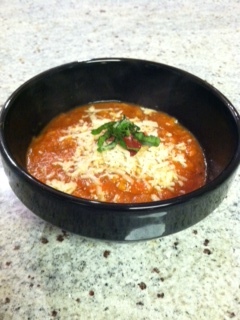 I honestly don’t even like tomatoes very much but I fell in love with this soup! What’s your favorite winter soup?? Maybe you should add this one to your repertoire! Kitchen Quickie: A Bacon & Sage Wrapped Turkey Tenderloin! Happy New Year’s Eve everybody! 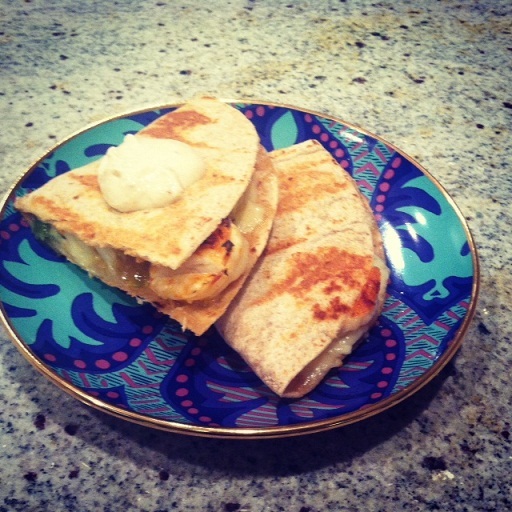 Watch the video for step-by-step directions for this delicious dish! Is there a dish you’d like to see me tackle in the new year? Send us an e-mail or comment below! I recently cook a pork shoulder for some pork chili I was making. (I’ll share that recipe later.) It was about six pounds, so there was a lot of pork left. 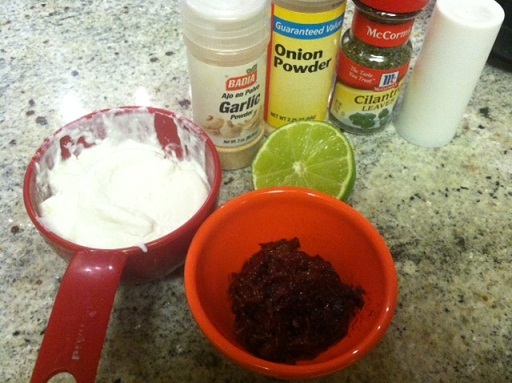 I thought about what to do with this leftover pork shoulder meat, and it came to me — BBQ Pulled Pork Tacos. Heat your olive oil in a pan. Place your onions in the pan and cook until onions are soft and translucent. Get your pulled pork ready. Place your pulled pork in the same pan with the sauteed onions. 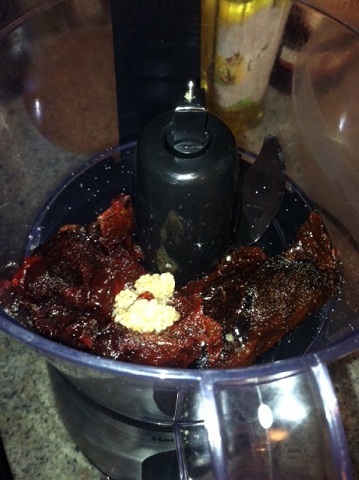 Add the cumin and cayenne pepper. 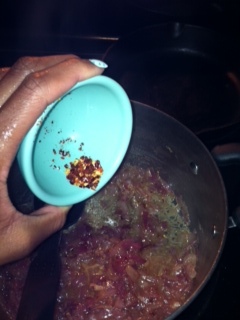 Stir up to ensure the seasonings spread throughout the meat. Then add your barbecue sauce. You may want to add more or less, depending on your personal preference. The final BBQ pork should look like the picture at the bottom. 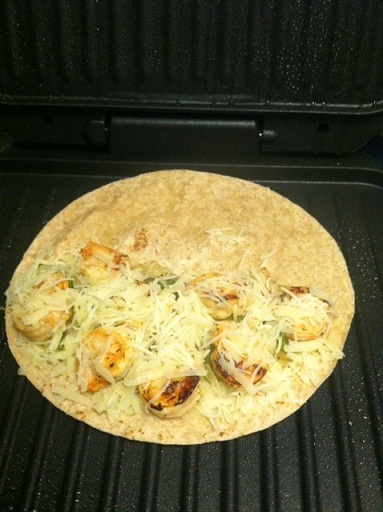 Here is my BBQ pulled pork taco, dressed up with salsa verde and shredded cheddar cheese. 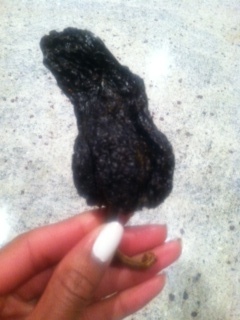 It was so yummy!! 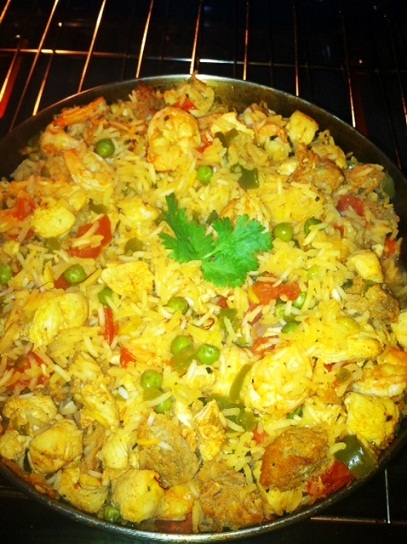 Recipe du Jour: Paella with A Twist! The other day I was checking out the latest and greatest going on on our twitter feed (@HighLifeSuite) and I chanced upon a tweet that said July is national paella month. Now, I don’t know if that’s true or not, google didn’t back that up, but regardless, that tweet put me in the mood to dig up my paella recipe and hit the kitchen! 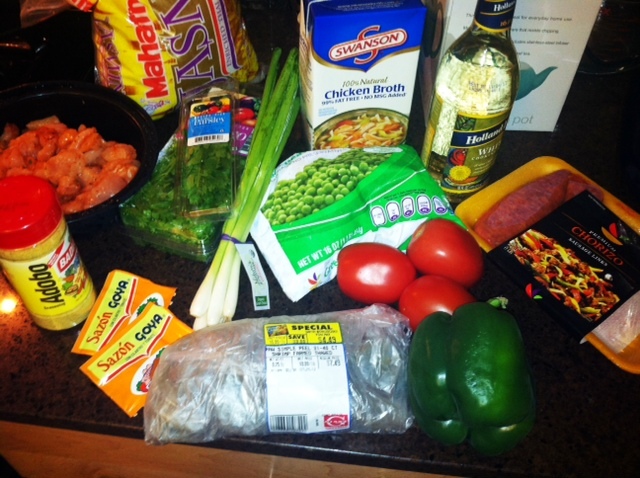 I’ll warn you that this recipe varies quite a bit from a traditional paella, but it is also a little friendlier on the pockets and has an Asian fusion flair. 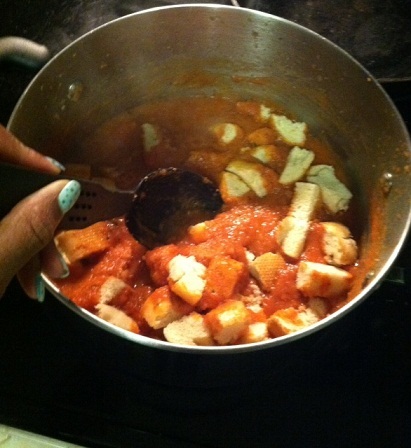 Begin by slicing your chicken breast into cubes and seasoning with the paprika, garlic powder & onion powder. Place the seasoned chicken in the fridge for an hour. While the chicken marinates, place your chorizo(if it isn’t the smoked kind, which mine was not) in a skillet with a 1/4 of water and cover, allowing the sausage to cook all the way through. 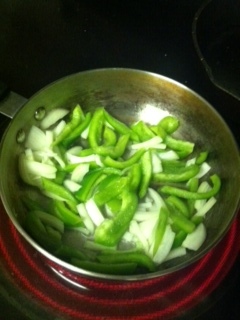 While the sausage is cooking, dice your bellpepper, tomatoes, scallions and cilantro; set them to the side. Also, turn your oven on to 350 degrees and allow it to pre-heat. 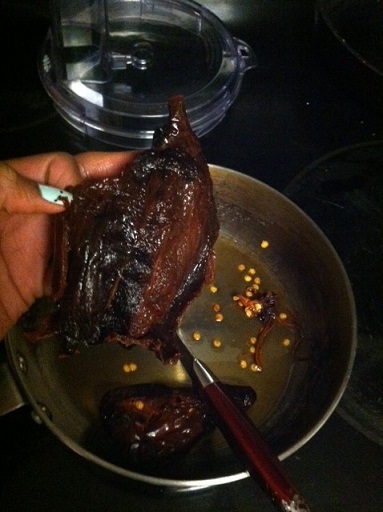 Once your hour is up, remove the chicken from the fridge and saute in a skillet until done. Add your shrimp to the skillet. Once the shrimp has turned pink and is slightly curled, transfer the chicken and shrimp to another dish in order to prepare your veggies. 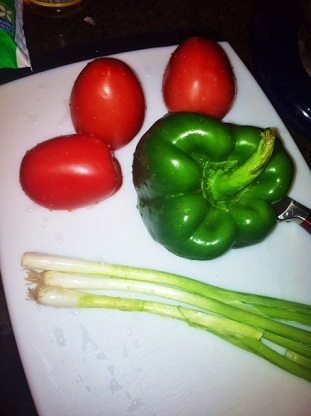 Now it’s time to saute the diced tomatoes, scallions, bellpepper, cilantro and crushed garlic. 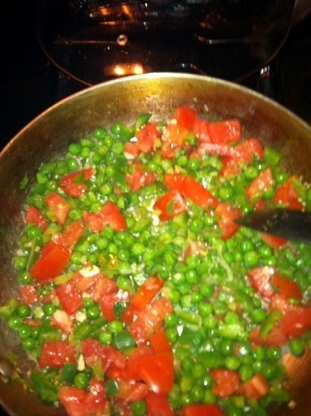 You’ll also want to add the 3/4 cup of frozen peas at this time. Once the veggies have softened up, go ahead and scoot them to the perimeter of the skillet, creating a well of sorts in the middle. In that well, place the 1 1/2 cups of Jasmine rice. 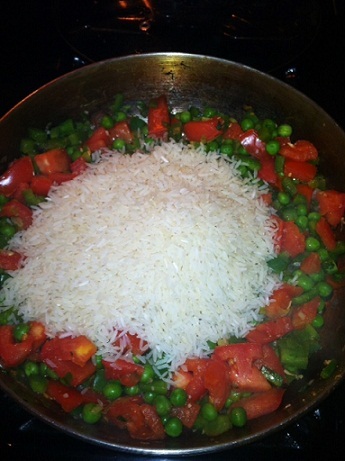 Fold the rice into the veggies and allow the rice to brown up a little. 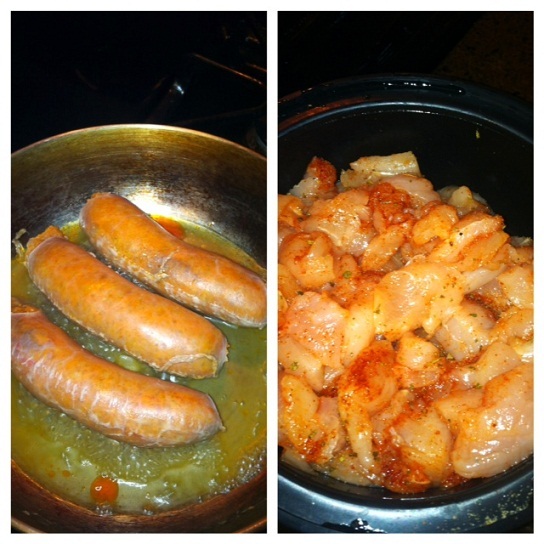 At that point add in the chicken, shrimp and chorizo. 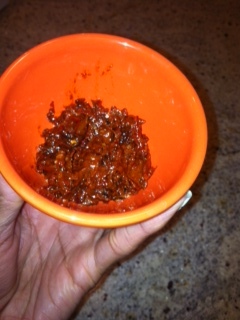 Also add in the packet of Sazon, a dash of pepper, a sprinkle of Adobo seasoning and a pinch of saffron threads. Allow the mix to cook atop the stove for about 5 minutes. It’s not time to add in your 1/2 cup of cooking wine and 2 1/2 cups of chicken stock. 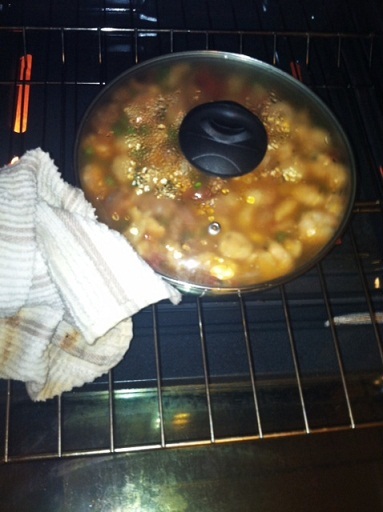 Once all the liquid has been added to the skillet, cover it and place into the pre-heated oven. 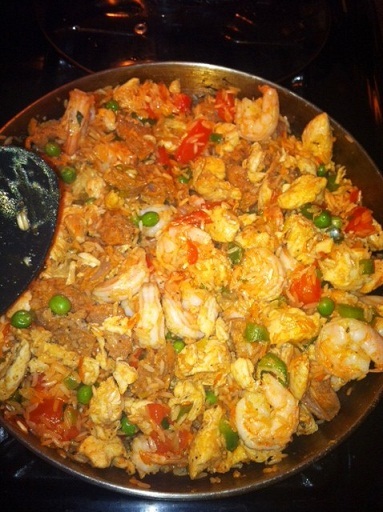 Allow the paella to cook for 25-30 minutes, until the rice is soft and fluffy! 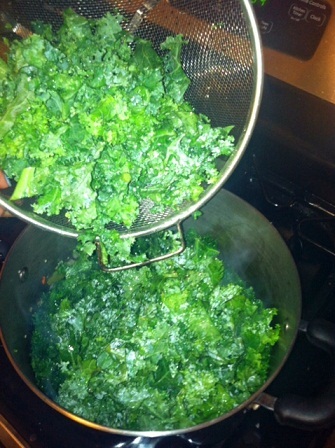 This may seem like a complex recipe, but trust me it’s super easy! I’m all about simple, low fuss recipes so I wouldn’t steer you all astray 🙂 Next time you fill like getting a little fancy in the kitchen, think of this twisted take on a Spanish favorite! If any of you all try this recipe, we’d love to hear about it! 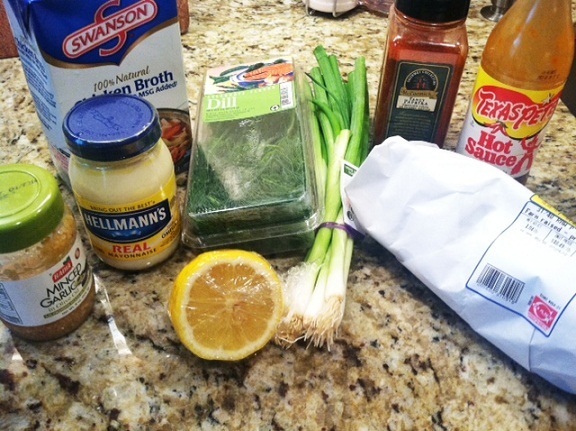 Recipe du Jour: Shrimp Salad! Hey everybody! Hope everyone enjoyed their 4th, we sure did! Today’s recipe is simple, quick & as usual guaranteed to put a smile on everyone’s face! With cookout season in full swing, this recipe for shrimp salad is a great addition to any spread! 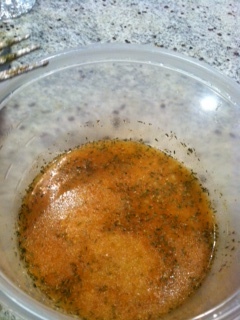 Bring the cup of chicken stock, thyme, basil, garlic, celery salt and pepper to a boil. 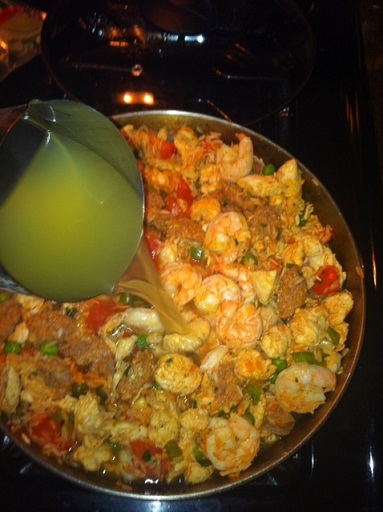 Add in shrimp and cover. 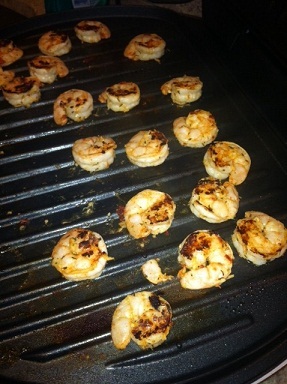 Cook shrimp until pink and slightly curled, signifying that they are done. Set to the side to cool. 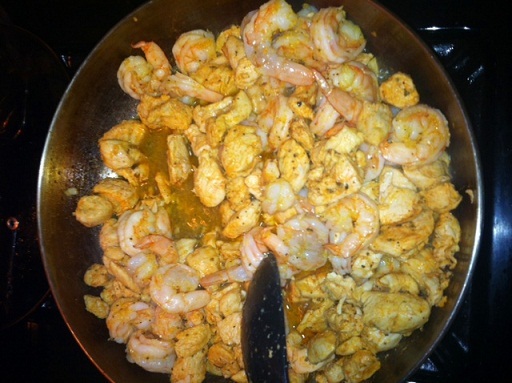 While the shrimp are cooling you will want to get started on the “sauce” for this recipe. 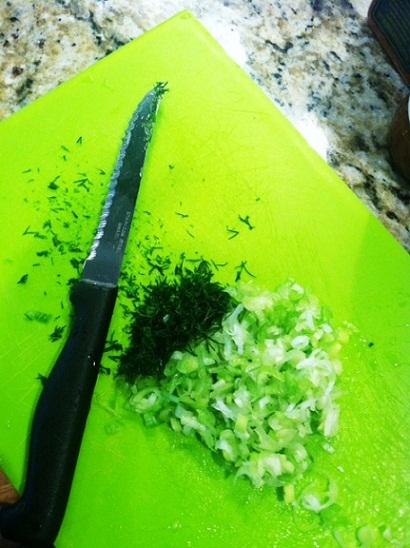 Finely chop both the dill and scallions and set aside. 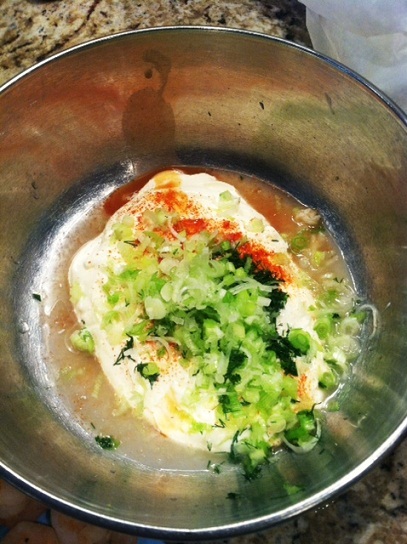 In a bowl, combine the mayonnaise, juice from 1/2 the lemon, paprika, hot sauce, the diced dill & scallions and stir together. 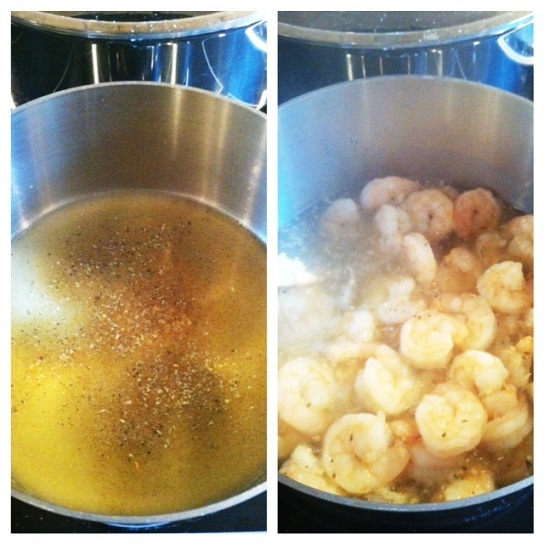 Once you finished with the sauce, dice the shrimp and fold them in to the sauce to complete the shrimp salad! Just like that, the dish is complete! 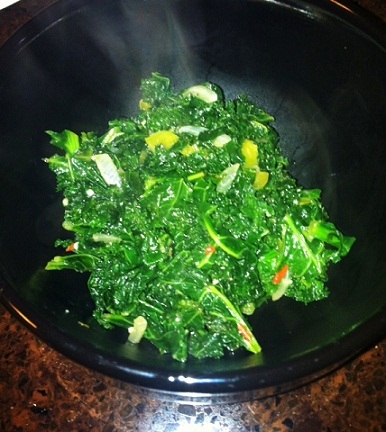 Place the salad in the refrigerator for about 30-45 minutes before serving. 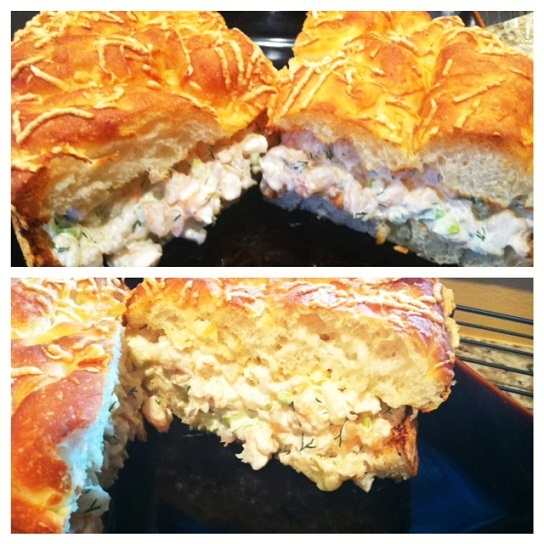 My favorite way to serve the shrimp salad is on warm focaccia bread, as a sandwich. 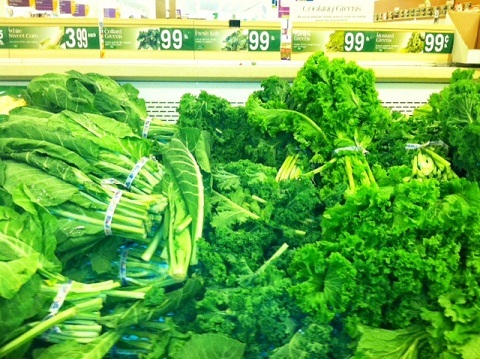 You can also serve it on a leaf of lettuce as a shrimp salad lettuce cup! 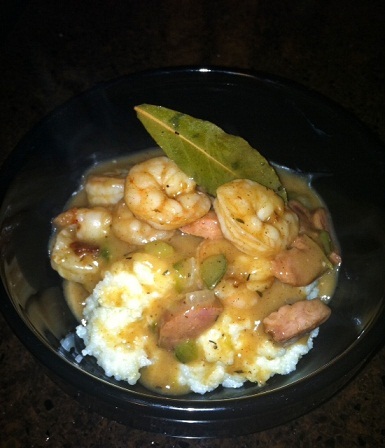 Recipe du Jour: Shrimp & Grits! Despite my city girl ways, I am truly a Southern belle at heart. Both sides of my family are deeply rooted in the South and so Southern culture has always been a major part of my life. It’s only natural that my favorite aspect of that culture would be the food! And one of my favorite Southern dishes is shrimp & grits. Before you get started, peel & de-vein your shrimp. Season with your favorite spices/herbs. 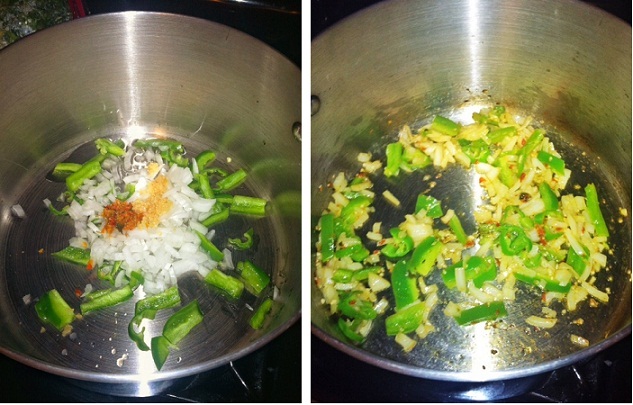 I prefer the ones pictures above: garlic powder, cayenne, celery salt & thyme. 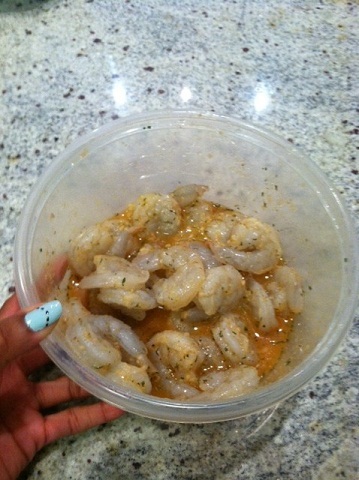 Place the shrimp in the fridge while you prepare your “stock”. The first step to making your “stock” is to create your roux. 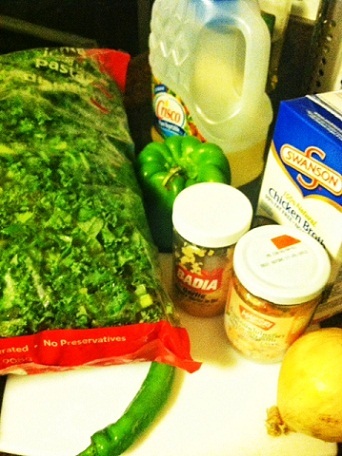 The roux is going to be the base for this recipe. 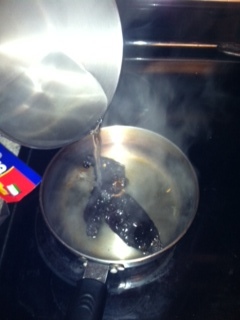 Begin by heating up a skillet and cooking the 4 strips of bacon. Once the bacon has cooked down remove it from the skillet but leave the renderings. 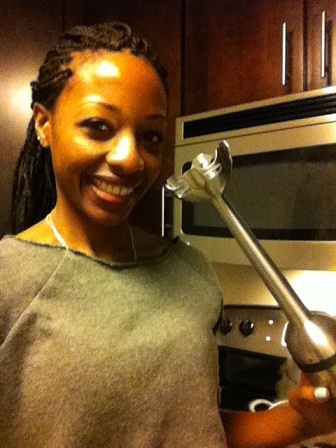 Add your flour and stir. Allow the flour to brown; the deeper the color, the deeper the flavor. After a couple minutes, add in the diced onion, bell pepper & celery(the holy trinity as I like to call it) and continue to stir. 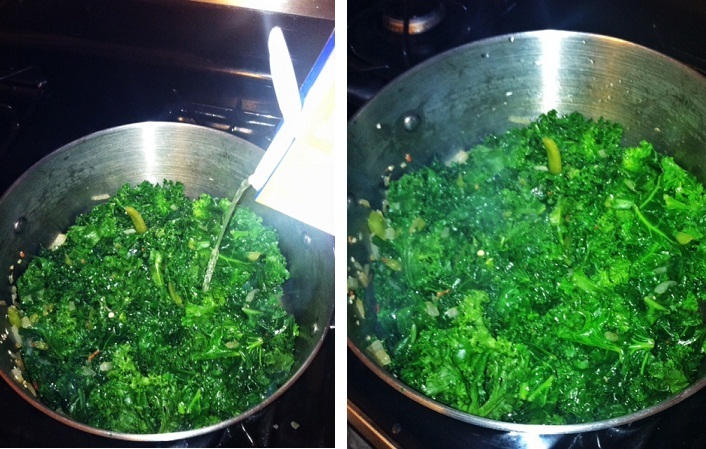 Allow the veggies to soften a little before slowly pouring in your 2 cups of chicken stock. 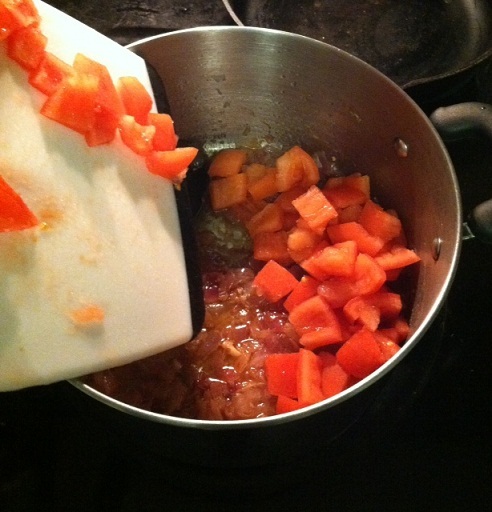 Remember to stir while adding in the stock because as you will notice, the mixture will quickly begin to thicken and stirring will prevent chunks from forming. 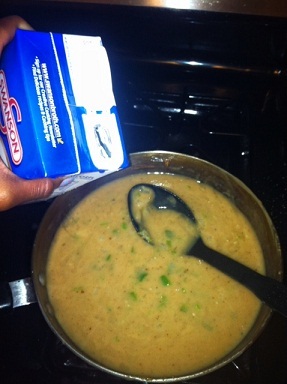 If the mixture looks too thick, add in a little more stock but be sure to only add in a little at a time. Once you’ve achieved the desired consistency, add the sliced andouille sausage. Since the andouille is already smoked, you don’t have to worry about waiting for it to cook; however, you do want to allow enough time to let the flavors of the sausage meld with your stock. At this point, you will also want to add in your bay leaf. After a couple minutes, it’s finally time to add the shrimp! As you prepare to toss those babies in, I would suggest you go ahead and get the grits started(recipe to follow). Grits literally take no more than a few minutes to cook and so do shrimp. This way both components will finish up around the same time. 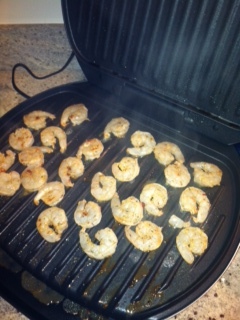 Allow the shrimp to cook a few minutes, until they are pink and have begun to curl up. Pour the milk into a small saucepan(a friend of mine taught me a couple years back that milk is the key to creamy grits). Add in the butter and the dash of salt. Allow the butter to melt and the milk to come to a slow rolling boil. 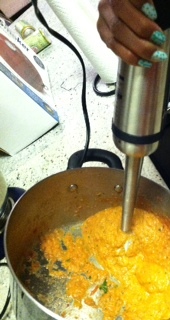 Slowly add in the grits, making sure to stir continuously to prevent clumping. Instant grits should only take between 3-5 minutes. Once your grits are finished, you are now ready to plate your meal! 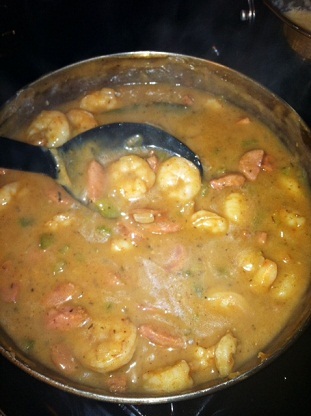 Next time you’re looking for a recipe that will satisfy & impress you and your dinner guests, think of my shrimp & grits. Trust me, you won’t regret it! So your friends just called and they’re on the way over. You’re thinking about preparing something to eat, but you have no clue what to prepare. You need a recipe that’s quick and delicious. 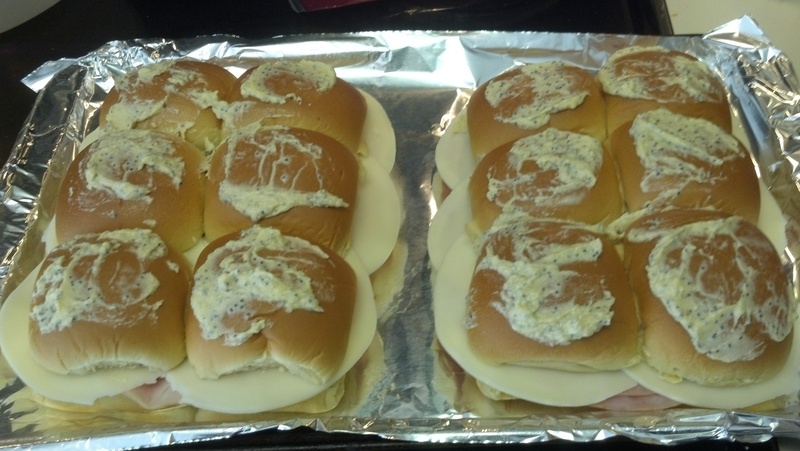 I have the perfect recipe for you — Ham and Cheese Sliders. They are easy to make, filling and good. These sliders can be put together and ready to eat in under 20 minutes. Cut rolls lengthwise and lift off top. 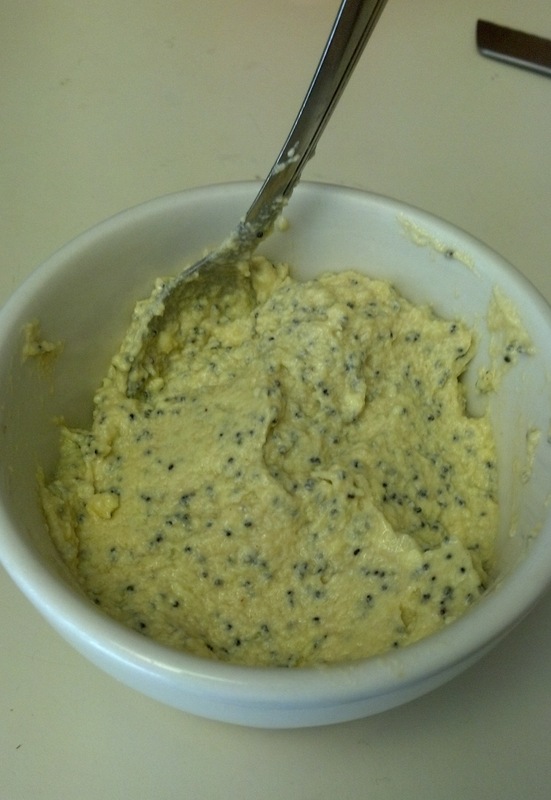 Combine butter, poppy seeds and dijon mustard into a bowl. 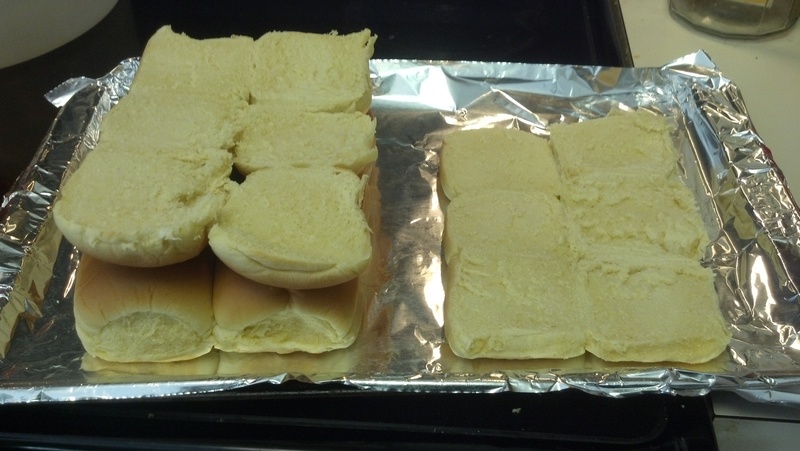 Spread mixture on bottom of rolls. 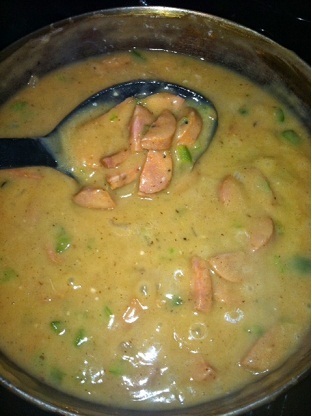 Add a slice of ham and cheese over mixture. 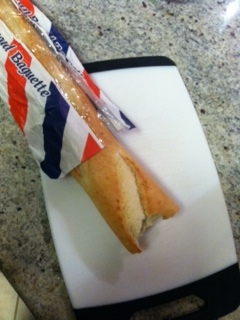 Place top of rolls back on sandwich. 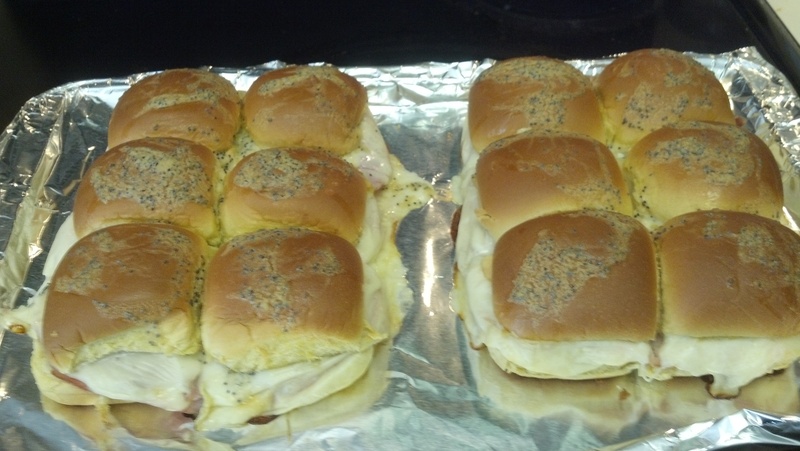 Spread remaining poppy seed, butter, mustard mixture on top of rolls. Bake in the oven at 350 degrees for 15 minutes or until cheese and mustard-butter has melted. Serve hot or warm and enjoy! These sliders are sure to be a hit amongst your friends.